We just finished some hot, hot days, feels good. Garden is growing. Been picking spinach and swiss chard for my morning green smoothies. I have a bunch of pok choy I have to do something with. Strawberries are a daily treat and I froze a bunch of soska (sorrel) for soup later in the season. Again, I planted my radishes too late, oh well. Grandma Anne dropped by (she’s 86) and we did a garden tour and assessment. Comparing tomatoes, rhubarb and sorrel and my plans for the perennial bed in the front. 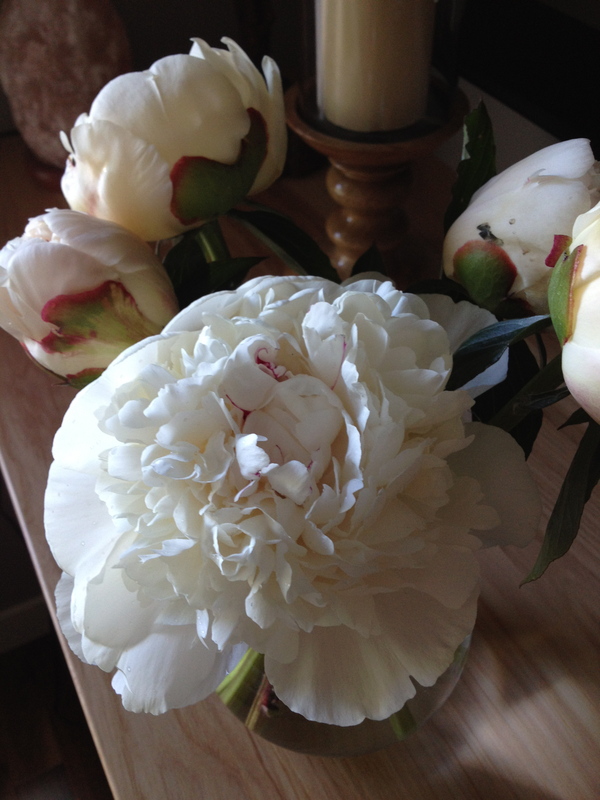 I already miss my peonies, they’ve all bloomed, they are my favourite. 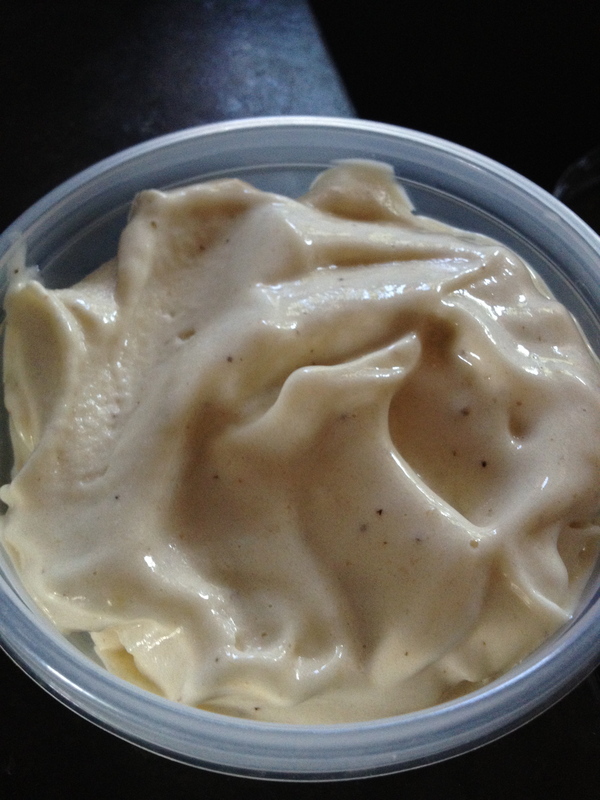 Hot days warrant ice cream and on one of those hot days I remembered one of the first raw food recipes (if you can call it a recipe) I learned was banana ice cream. It is so ridiculously easy it’s just worth a try. For vegans, it is spot on. Seriously, try it. 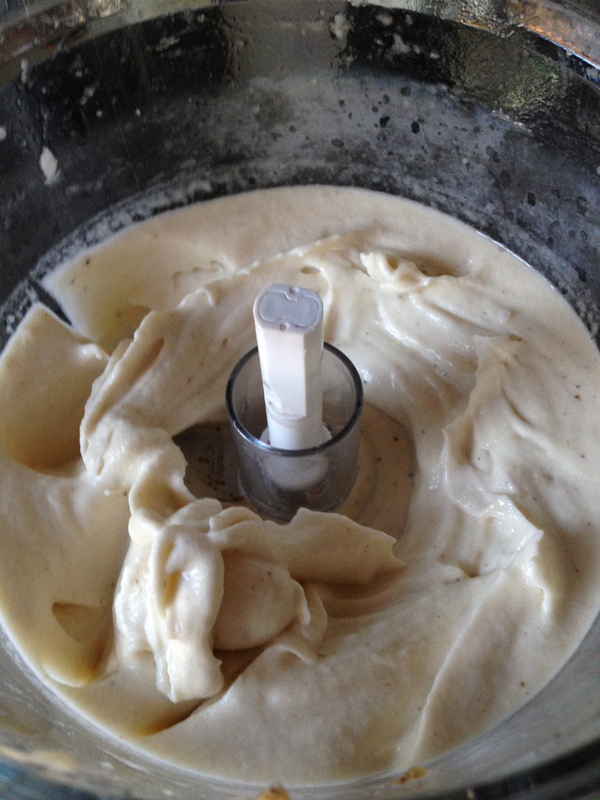 Take ripe to over ripe bananas, slice them up, freeze. Once the bananas are frozen, take them out of the freezer and leave them on the counter for about 5 minutes, so the pieces easily come apart and soften ever so slightly. 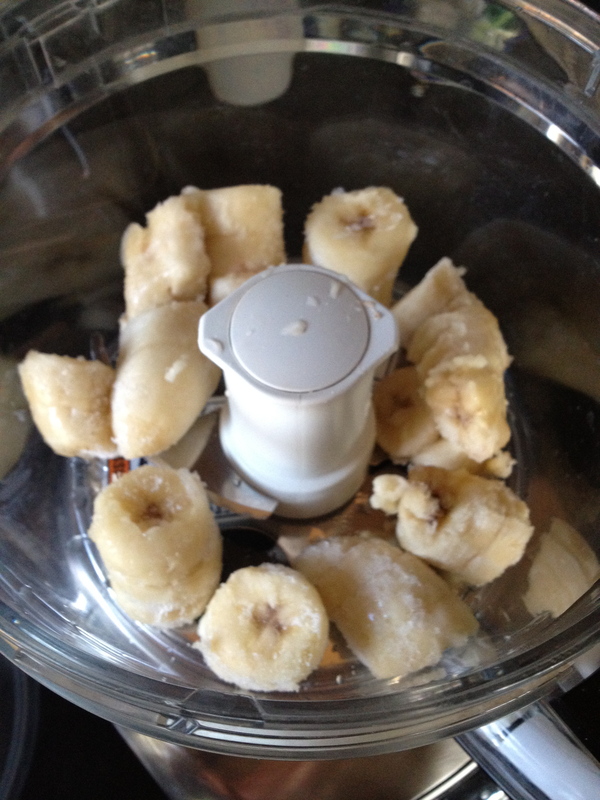 Put the bananas into a food processor (I haven’t tried this in my Vitamix, but I imagine it would work, maybe not as smooth, not sure). Turn it on, let it go. Stopping now and then to push the bananas down on the sides. Your done. If it’s too soft, I pop mine back into the freezer for another 10 minutes to harden up. You can add other fruit, flavouring, honey for sweetness, but it’s perfect on its own. In discussing this with some fellow Health Food Junkies on the weekend, I’ll try adding some unsweetened cocoa powder and unsweetened shredded coconut next time. So go and cut up some bananas for the next hot day (it’s a bit dreary here now, but much needed). Soon we will be saying farewell to 2011 and hello to 2012. How’s that feel? Another year to reflect on and another year to look ahead to. Lots to think about… I like the week between Christmas and New Years, lucky for me I usually don’t work so it is time to dig into books, my yoga practice, kick up the healthful routine and spend quality time with friends. 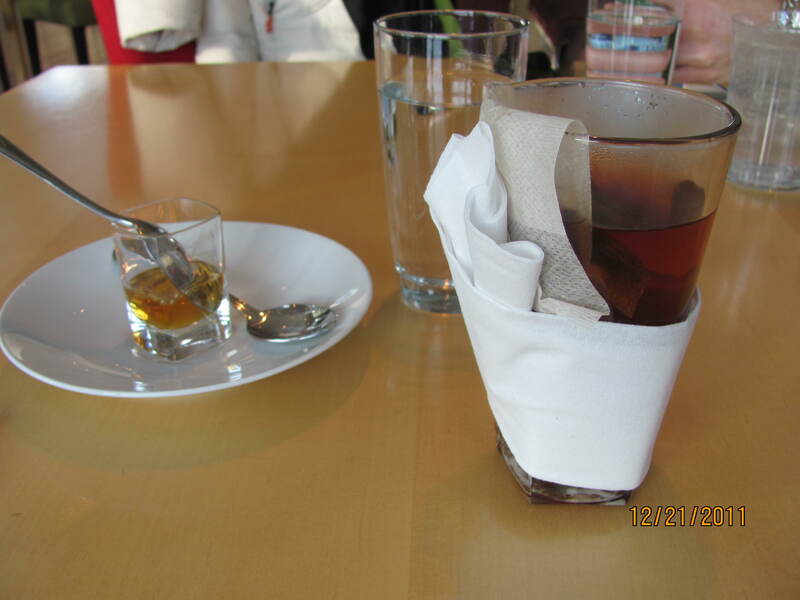 The weather here has been so amazing, walks with good friends and tea dates have been a good way to spend the time. What have you been doing? I stuck to my green smoothies throughout most of the holidays, this routine is so important and if you haven’t tried it, maybe next year ;). Green smoothies are a good way to pack in the vitamins and nutrients any time of the year. Here is an easy recipe: 1 small or 1/2 large banana, 1/2 cup frozen berries of your choice (makes the smoothie not so green though), 1 stalk of celery, 2 cups water and a few big leaves including stems of swiss chard. If you don’t have a good strong blender you might have some clumps, but whatever, it tastes good and it’s good for you. Maybe next year you’ll buy a Vitamix as well! In the fall I picked a bunch of mint from the garden and dried it out. I like mint tea on its own, but I thought I’d experiment and mix it with other flavours. I grated the zest from three organic lemons and let it dry and bought dried grated ginger from Life with Style from my favourite market, KFM. 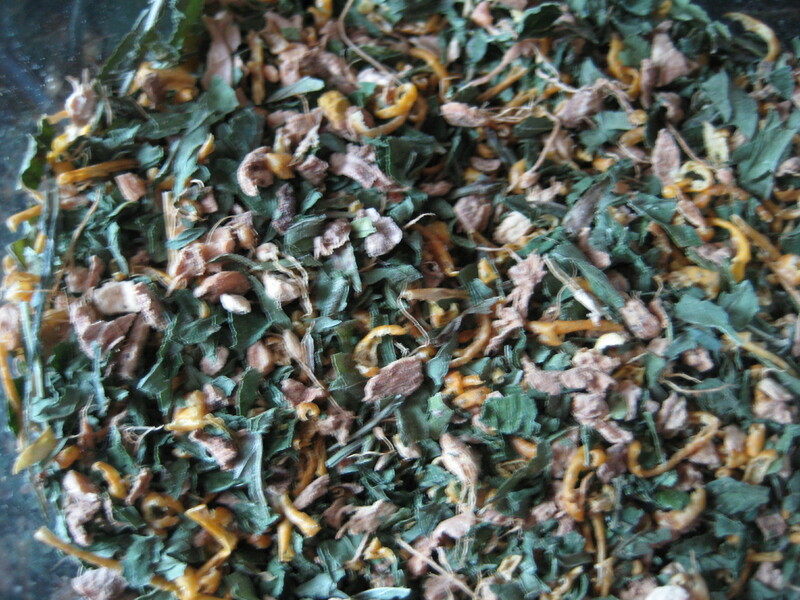 I mixed equal parts mint, ginger and lemon together to make an herbal tea. Turned out pretty good. One of the most popular recipes on this blog is the Spicy Black Bean Soup – I made a pot of it the other day, mmm good and nourishing. Froze some for work next week. I gotta say though, I couldn’t find a sweet potato near by, so I used a regular potato, it turned out fine but you certainly miss the flavour of the sweet potato. 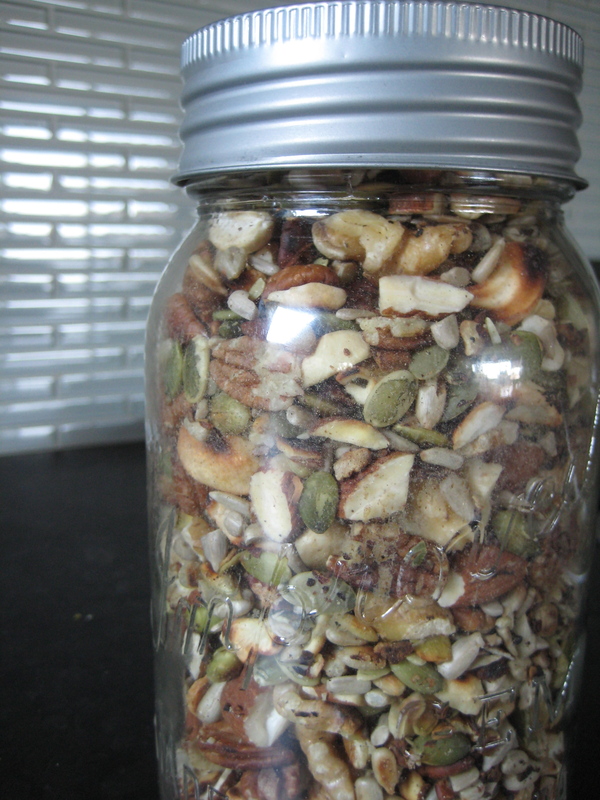 I also toasted a new jar of mixed seeds and nuts to put on my whole grain breakfasts. Although I love sprouting grains, good old oatmeal has been my fave these past few weeks, easy and warming. Lightly toast roughly chopped walnuts, almonds and pecans in a medium-high dry pan, stirring often. Add pumpkin and sunflower seeds, toast until you hear them pop. 1/2-1 cup each nut and seed. Let cool and store in air tight jar. Order organic from Real Raw Food. Thumbing through the newest City Palate get’s my cooking juices going…time to get back to the kitchen and experiment with more healthful eats. Wishing you all a healthful and happy New Year.